For some time now, middle-aged sociopath Mr Henry Droop from Littlehampton has been unhappy with the state of his local newspaper. Mr Droop, who has a keen interest in local affairs, has taken the Littlehampton Evening Observer for six years. "I find that the national newspapers, whilst often packed with scandal and intrigue, nevertheless offer very little of relevance to my own personal life," he says. "Oh, it is all very well reading about some uprising in Africa, or some summit meeting halfway round the world, but at the end of the day this kind of thing does not personally affect me. "I need to know about what is happening in and around my own personal area - commemorative plaque unveilings, vegetable competitions, Women's Institute meetings and that sort of thing. Fair enough, so these things might not seem like big, exciting news events, but they are of great import to someone who personally lives and works within the Littlehampton region." That said, Mr Droop's thirst for local news has recently led to him becoming disillusioned with the Evening Observer. "I have noticed just lately that many of their stories concern events that happen right over on the other side of town," he told us. "Whilst it is fascinating to read about such things, they do not really effect me. "Increasingly, I have become disappointed that events that happen in my own personal neighbourhood hardly get a mention. For instance, the Jones's at number thirty-two lost their cat just the other day. It came back within an hour but, even so, it was not mentioned in the local paper. "That is why I was so pleased when the man two doors up from me - Mr Bullimore - decided to produce his own local paper, which focuses on all the events that happen in my street - it is a very local paper, if you like. 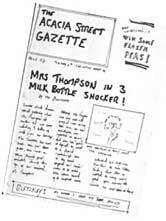 It's called the 'Acacia Street Gazette' and he writes them all out individually with a biro. "There is all the news, gossip and weather forecasts that you would find in a regular newspaper. And the traffic reports are spot on, because Mr Bullimore stands at his window every morning and notes down what time everybody leaves to go to work. "Yesterday's issue featured a story about the Frampton boy at number twenty-six, who borrowed his dad's car and apparently did not get home until two o'clock this morning. Then there was an update on the Mrs Brownlow situation. She still has not returned from her mother's and eyewitness reports reveal that Mr Brownlow has been seen out and about with an unknown blonde. "My personal favourite was the horticultural feature, focussing mostly on the state of Mr Tompkinson's back garden. There was even a poll: 'Should Mr Tompkinson cut down his cherry tree - you decide'. I shall personally be very interested to see the result of that." However, delighted though Mr Droop is with this innovative new publication, he does still have reservations. "Oh it is not perfect," he admits. "Rather a lot of the stories centre around the houses up at the top of the street and do not really concern us down here. For instance, there was an item about one chap who had a skip parked in the road all day Tuesday, obstructing the traffic. Well, that really was not of any personal interest to me because I go the other way to work. "So anyway, I have decided to do something about it. If Mr Bullimore can produce his own newspaper, then so can I - but my paper will only concern news stories relevant to my house. Sales will be low, of course, because the news will only be of interest to everyone who lives here. And, as I live alone, that limits the projected circulation to one. "Still, it means I will be able to tailor the stories to my own particular needs. There will be up-to-date breakfast reports, the latest information from the bathroom and all the top financial news, as it breaks, direct from the old whiskey bottle on the mantelpiece where I put all my loose change. "And I am particularly looking forward to a forthcoming series of scandalous exposés about myself. It should make thrilling reading and I cannot wait to find out what I have been up to. I just hope it does not get too personal."